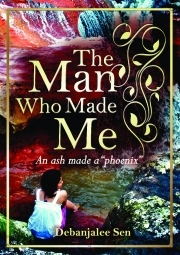 An ash made a "phoenix"
Description of "THE MAN WHO MADE ME..."
Debanjalee Sen was born in summer of 1985. People start writing by chance or by choice but she started writing by accident which resulted into " K 2 K - The [K] Konnection ", her first novel. But this accidental result turned her life from a Biotech Professional to a Full Time Writer. Her second novel "Boundless Saga of Love" was published by Srishti Publishers, New Delhi. Currently she pursues Freelance Content writing as her profession and Creative Writing as her obsession. Already with 3 Novels (including this book), few poems & few short stories in kitty, her passion is currently guiding her to write more novels & short stories for her upcoming publications. Reviews of "THE MAN WHO MADE ME..."